The outlet valve of a water-spraying device, used to provide a continuous stream of water to a small area. Impact rotors are able to distribute water over a surface area of 20-150 ft. (often in a 40 to 360 degree arc). Gear-driven motors are best for small commercial areas or very large residential areas. 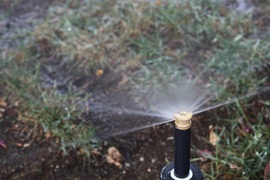 Large-turf sprinklers are commonly used for parks and golf courses. A standard pop-up sprinkler head averages $2 to $4; most lawns use 10-15 sprinkler heads.